Our final visit to the 2016 Brighton Early Music Festival (BREMF) on Sunday 13 November 2016, was Springtime for the pian' e forte from Trio Goya, Maggie Cole (fortepiano), Kati Debretzeni (violin), Sebastian Comberti (cello) at Ralli Hall, Hove. 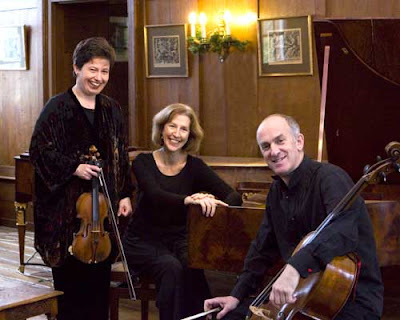 The trio performed Haydn's Piano trio in G minor, Hob XV:19 and Beethoven's Piano Trio in E flat Op.1, No.1 (both written in 1793), Beethoven's Violin sonata in F major, OP.24 (Spring) and Anton Diabelli's Gran Sonata in D major, Op.92 for cello and piano. Haydn's trio was his 33rd in the genre, the work still has its origins recognisably in the accompanied sonata, and though Haydn gives the violin melodic moments independent of the piano, he rarely lets the cello off the leash. Maggie Cole was playing a modern copy of a 1795 Viennese fortepiano by Anton Walter, and I had forgotten quite how light the tone of such instruments could be, so that both Haydn and Beethoven need to clear the strings out of the way to make room for the fortepiano, giving a sense of dialogue to both trios. Though Beethoven was only 23 when his trio was published, he was already pushing the envelope and his cello part is far more liberated than Haydn's and we are already well on the way to three full independent parts. So Haydn's Andante first movement opened with almost a fortepiano sonata, the material then repeated with strings. There were a couple of occasions when I wondered if the violin and cello were a bit too present in the balance. But this was lovely characterful playing from all three, with a superb sense of ensemble. The Adagio had a nice sense of singing line from both the fortepiano and the strings, with some lovely little corners. The final movement, Presto was a perky delight taken at quite a fast tempo, something facilitated by the quick die away on the fortepiano. Next came Beethoven's Spring sonata, from 1801. The lovely Allegro opening movement had a nice freshness of tone from Kati Debretzeni, along with flowing fluidity of playing. In the lyrical Adagio, the two instruments kept swapping roles, the one accompanying the other. In the Scherzo (the first time Beethoven included this movement in a sonata), the music brought a real smile to the face. The final Allegro was full of alternation, piano alone and then with violin, all brought characterfully alive. We are so used to hearing performances with the dominance of the modern piano, so it was interesting to hear Beethoven's creative solutions. This was very much brought home in Diabelli's Cello sonata, where Diabelli's writing was attractive and more than competent, but lacked the imaginative flair found in Beethoven. But, as Sebastian Comberti said in his introduction, it was interesting to hear what else was going on in Vienna (Diabelli wrote his sonata a few month's after Beethoven's Cello sonata). Finally we heard Beethoven's piano trio. The simple but arresting opening of the Allegro demonstrated Beethoven's willingness to create a real three-part texture on occasions, and the development section included some lovely dramatic moments. The Adagio cantabile second movement started as a piano solo, and when the strings came in they commented rather than immediately reprising the material	and the cello got a lovely solo. The Scherzo was delightfully perky, with a sense of excitement. The Presto finale had a nice Haydn-esque wit about it, and was taken at a pretty fast tempo too. The whole gave a great sense of the breath of fresh air which the young Beethoven brought to the piano trio form.